A carte de visite from the David Neville collection is a portrait of Capt. Jacob Lyman Greene, who served on the staff of Gen. George Armstrong Custer from 1863-1866. The editor is saddened to report the passing of renowned collector Herb Peck Jr. “Herb will be sorely missed by all who knew this courtly southern gentleman, but his scholarly devotion to history and early American military photography will not be forgotten.” In Mail Call, a correction is made to the photo on page 10 of the April/May 2004 issue. The individual identified as Philip Sheaf is actually 1st Lt. Pearl Humphreys. Five books are reviewed and recommended. Cased Image Photographs, from the Collection of the Museum of the Confederacy by the Museum of the Confederacy, Colonels in Blue, Union Army Colonels of the Civil War, New York (Schiffer Publishing) by Roger D. Hunt, First and Second Maryland Infantry, C.S.A., (Willow Bend Books) by Robert J. Driver, Under Both Flags: Personal Stories of Sacrifice and Struggle During the Civil War (The Lyons Press0 by Tim Goff and Burnished Rows of Steel: Vermont’s Role in the Battle of Gettysburg, July 1-3, 1863 (Vermont Civil War Enterprises) compiled and edited by Marius B. Peladeau. The authors tell the story of the life and times of Wilmington, N.C., native Tom Lockwood (1831-1877). After the Civil War began, he received a commission as a Confederate privateer and rose to celebrity status after he successfully transported newly appointed Confederate commissioners James M. Mason and John Slidell, and their families and aides, through the Union blockade to Cuba. The commissioners then boarded the Trent for the next stage of their journey, which ended prematurely when they were intercepted and captured by the San Jacinto, commanded by Union Capt. Charles Wilkes. Lockwood continued to frustrate federal blockaders for the rest of the war. The text is illustrated by a wartime and post-war portrait of Lockwood. The author explains that not all Union officers wore shoulder straps, believing that they made them special targets for Confederate sharpshooters and other enemy troops. The text is illustrated by ten images, including Maj. Nathaniel Wales of the 35th Massachusetts Infantry, Maj. Gen. J. Watts DePeyster, Capt. George R. Bell of the 37th Illinois Infantry, Brig. Gen. Samuel Sprigg Carroll and Col. M.R.M. McClennan. All these offices wear their rank in less conspicuous ways. The author highlights in photos and text the Capitol Building, the White House, the Soldier’s Home, the Post Office Building, the War Department, the Smithsonian Castle, the C&O Canal in Georgetown, the Seventh Street Wharf and the Georgetown Aqueduct and College. An image of 12 first-generation Germans who are all members of the Columbia, S.C., company. A brief history of the organization and service records of the following men in the photograph: Charles Schmidt, Nathen Peterson, J. Henry Burns, George Ehlers, Detrich Windhorn, Charles W. Shultz, G.W. Allworden, Henry Frank, Abraham Stork, William Wolfe, Jacob Blankenstein and John J. Stork. The author explores the military service and life of the man who saved faithfully beside the flamboyant general until he fell into enemy hands on June 11, 1864, at the Battle of Trevilian Station. He remained a prisoner of war until December 1864, when he returned to Custer’s side. Greene left the service in 1866 and lived until 1912. The story is illustrated with 11 images of Greene taken at various points during his life, including a 1902 image of him riding in a carriage with President Theodore Roosevelt. Though Parker and George Armstrong Custer were close roommates at West Point, the Civil War ended their relationship. Parker joined the Confederate army and ultimately became a lieutenant colonel of the 1st Mississippi Artillery. Deployed in the defenses of Port Hudson, he became a prisoner of war when the garrison of the city was surrendered after the fall of Vicksburg. He survived his imprisonment and the war, and lived until 1918. The story is illustrated by a carte de visite of Parker, and a second portrait of him with 1st Lt. Frederick Dabney, Capt. A.J. Lewis and Capt. W.B. Seawell. In “The 71st Regiment, New York State Militia ‘The American Guard,’” McAfee profiles the regiment and describes its distinctive uniforms. 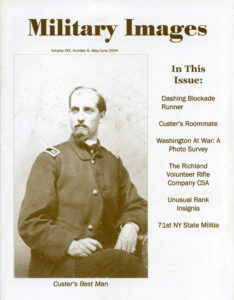 The text is illustrated with an albumen photograph of Sgt. E.W. Finley and a group portrait of four unidentified members of the regiment from the mid-to-late 1860s. Selections include a well-armed Confederate cavalryman, a member of Company D of the 1st Rhode Island Infantry, Capt. William S. McCaskey at Fort Assininboine, Montana Territory, in 1879 and Principal Musician Louis Bouchard of the 22nd Michigan Infantry. A salt print from the Michael Albanese collection is a portrait of Andrew Jackson Jr. A grandson of the seventh President of the U.S., he was a cadet at the U.S. Military Academy in the Class of 1858. He went on to serve in the 1st U.S. Cavalry until the start of the Civil War, when he served the Confederacy as colonel of the 1st Tennessee Heavy Artillery. He was surrendered with the garrison of Vicksburg on July 4, 1863. A quarter-plate tintype from the Al Niemiec collection pictures Lt. William L. Spalding’s company of the 12th Illinois Infantry.